There’s a huge difference between an an album and a single. A well-constructed album covers a lot of territory, taking the listener on a curated trip of orchestral/head-banging highs and mellow lows, while a single is a quick hit of music that’s all highlight, no journey. Arcade games tend to be more single than album in their construction but the metaphor breaks down because few have a B side. The only one I can think of is I, Robot (although I’d be happy to learn of any I don’t know about or have forgotten) but now it’s got company with The Minotaur Arcade Volume 1. 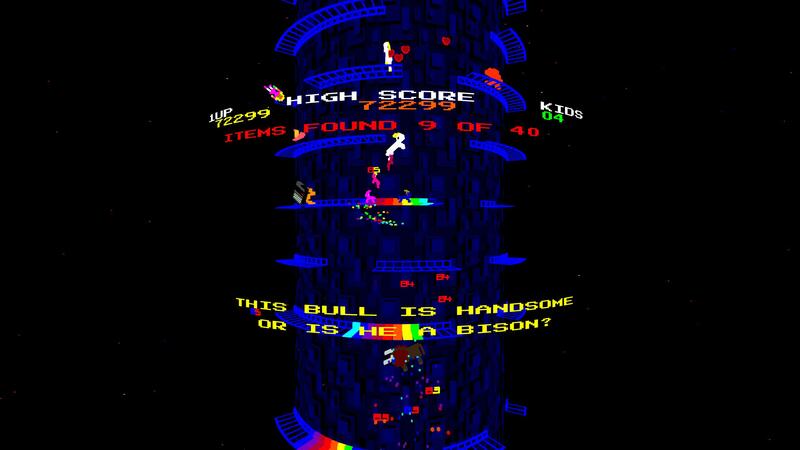 The Minotaur Arcade is a project Llamasoft started to resurrect its lost iOS games, saving them from the memory hole of an OS upgrade that left the entire series inoperable. They made nothing to begin with so updating the nine games in the series on mobile would just be throwing bad money after good. Llamasoft does like to keep its games available, though, so having this section of the library lost to time didn’t sit well. The natural solution was to upgrade the series on platforms people actually want to buy games for and The Minotaur Arcade Vol. 1 is the first of what should hopefully be several releases. 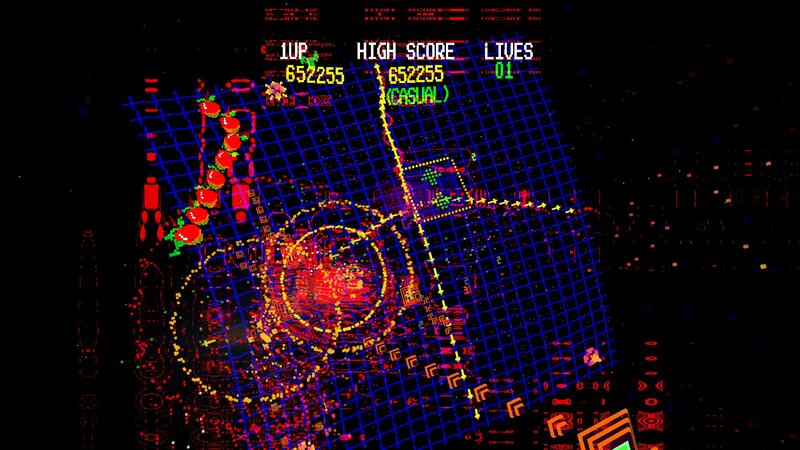 MAV1 is a two-game set headlined by the latest entry in one of Llamasoft’s most popular series, Gridrunner, and backed up by what had been an all-new title when it was released, Goat Up. Goat Up is a cute and relatively simple platformer where a goat hops up platforms on the outside of a cylindrical tower, seeking out billy goats and avoiding the enemies plucked from antique computer gaming history. Gridrunner, on the other hand, is a giant ravenous beast of a shooter, where the only hope of survival is to boost your firepower to such a ludicrous amount that enemies are eliminated almost as fast as they appear. Both titles were originally 2D but have been converted to voxelized glory, with particles flying everywhere and the illusion of depth of the originals having transformed to a view that practically places your face inside an arcade machine. This is especially true in VR, which is supported but not required. Goat Up benefits from VR the most, with the tower changing from showing a few levels-worth of platforms to being a structure you can look up and down, plotting a course to the next billy goat or giving a better view to avoid the descending enemies. Gridrunner is one of the rare cases where playing in VR and non-VR is an even trade, thanks to the lightning-fast and precise mouse support being a monitor-only option. Gamepad is nice on Gridrunner and perfectly fine for high-end play, but the thought-free controls of the mouse gives it an edge that easily matches the immersion of VR. As for the games themselves, and starting with the B-side, Goat Up is a pleasantly weird platformer. A lady goat starts at the bottom of a tower and eats grass wherever she goes, unearthing collectibles and avoiding the oxen along the way. Every now and then a billy goat shows up, and if you touch him, a kissing sound indicates instant pregnancy in a biologically-questionable fashion. Keep eating the grass and a kid appears, trailing along behind, and the trick is to get enough of a family going that you can use the trailing family-chain to knock enemies off the platforms. Mother Goat is fragile but the kids are invulnerable, so the family acts as protection against the ever-more-numerous hazards of the tower. If mom takes a hit this sacrifices a youngling, and with little invulnerability time, it’s worryingly easy to lose a lot of family in a short period of time. As the tower goes up it starts mutating from its initial pastoral setting. The grassy platforms turn into neon-blue outlines that become rainbows when you graze them, another section has bridges that can only stand a single crossing before shattering and yielding a nice point bonus and elsewhere has ground that sinks then disappears if you stand on it too long. The occasional oxen turns into wandering Jet Set Willys, or the car from um… really old game. The icons you dig up by grazing get nicely weird and obscure, like a giraffe from the Nintendo DS Zookeeper or duck/dragon from Adventure. Goat Up is a wonderfully silly little platformer but its humor covers a game that’s more than happy to make you very dead, very quickly, if you’re not bringing your best. Gridrunner is no less unforgiving, but also gives you an insane amount of power to push back against the onslaught. An auto-firing ship starts at the bottom of a grid while enemies stream in from the top. Outside the grid and untouchable are two ships, the X and Y zappers, constantly moving across the top and left sides of the playing field. Every few seconds they let off a zap, with the left ship firing a harmless shot that turns into a mine when it meets the deadly line of force let loose by the top one. Mines are only dangerous if you plow into them, and seeing as they take only a few shots to clear off the grid they’re generally harmless, unlike the top zapper’s line of force which is amazingly easy to plow into at full speed no matter how big and obvious it is. And that’s before the enemies stream in. 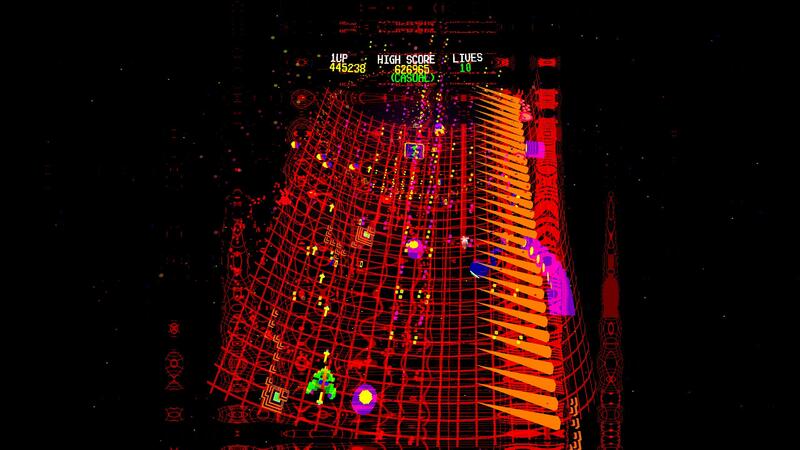 Gridrunner originally came out for the Vic 20 in 1982 and was Llamasoft’s take on the gameplay of Centipede. Enemies travel in a connected line, shooting the head is best so that the piece behind it plows into your next shot, every shot enemy turns into a hazard on the board and shooting the enemy in the middle breaks the line into two. While the basic idea is still the same the series has gone in many different directions over time, but this new version starts off as a back-to-basics affair before going completely off the rails into pure madness. The grid that’s the playfield starts off from the standard front view but every other level changes the viewing angle, and that included levels that are curved horizontally or vertically. The standard enemy-chains are soon joined by missiles that drop down the playing field before exploding in a burst of firepower if you don’t shoot them first, moons shatter into smaller moons with a deep lovely rumble, flying saucers bobble across the screen raining a steady stream of bullets and plenty more crowd the grid to destroy any notion of safety you might have had. Which would be a problem without the power-ups. Every enemey-chain has the chance to drop a power-up and certain harder enemies are guaranteed to leave something behind. When the level or a new life starts you’ve got a relatively slow shot but each successively destroyed enemy speeds up your shots while adding a rear-firing bullet to your attack, but this wears off if you don’t keep the kill-chain alive. Power-ups are also temporary, but once you’ve got one it becomes much easier to destroy things fast enough to generate another, and the effects stack. Get a four-way shot and a spread-shot and you’ve got some great coverage and this only gets better when laying on the sunburst power-up. Add on the hyper-shooting effect received from destroying a rainbow pyramid and you can coat the entire grid in bullets, flying with impunity thanks to a split-second moment of invulnerability after pickup. The trick to the later levels is it keep the firepower chain alive, destroying at such a fast speed that the screen rarely has a chance to get too crowded. Once you get to the mid-30s (of 100 levels) each new level is a marathon, demanding you find the trancelike Zone and sit there comfortably for however long it takes to finally clear the last enemy and advance to the next area. As is standard for Llamasoft since way back in the Space Giraffe days, Gridrunner comes with three modes available: Casual, Pure and Endurance. Endurance is a three-life trip as far as you can make it with no extra lives, Pure is the starting on level 1 with an extra life awarded after each successful level and Casual is for when you want to choose a level you’ve visited already. After a little experience I found Casual to be the standard mode I’d play, hopping in a few levels before the current bottleneck to try to earn a few lives and make another attempt. The game saves your best performance on a level based on score and remaining lives, so if you play halfway decently, it’s relatively easy to improve the starting life stock on an area that’s giving you problems. It makes going back and replaying incredibly easy to do, both for the sense of progress and Gridrunner‘s fantastic skill at dragging the player into a zone-trance. While Goat Up is good fun and Gridrunner truly fantastic, the bundle does come with a small warning that the UI takes a bit of learning. It’s not technically bad, but also not well explained (other than on the Llamasoft web site) either. When you start a game it opens up a dialogue box where you can choose resolution, plus three buttons and a tick-box for other features. The tick-box is for Arcade mode, which isn’t explained anywhere but is a feature for when you want to play with friends but don’t want to save scores to the leaderboard. The other options are Start VR Mode and Configure Keyboard, which are self-explanatory, but Start Normal opens the game up in a window and the standard alt-enter does nothing. F1 brings the game fullscreen, which the attract mode simply doesn’t mention anywhere. The standard keybinds are also non-normal, with Y on the gamepad being Pause or Menu, depending on where you are, and for keyboard controls that’s the I key. Why? Who knows! Thankfully the Configure Keyboard function is available to fix this, but it’s a weird place to start. On a positive note the left trigger recenters the VR viewpoint, which is just fantastically simple and convenient when compared to other VR titles. 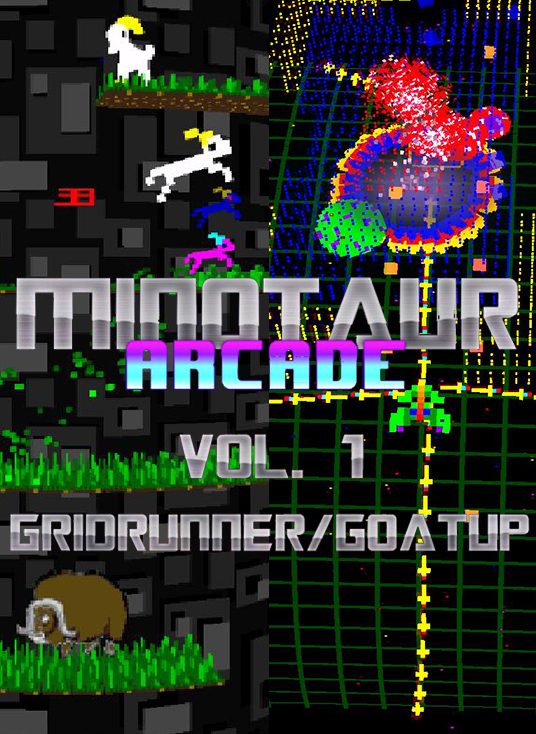 Minotaur Arcade Volume 1 is a great little bundle of two games that deserved better than to be lost to an obsolete mobile phone OS. 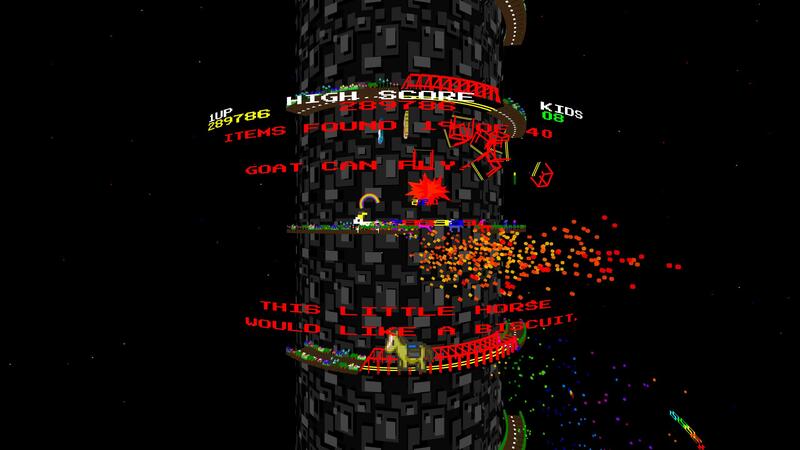 While Gridrunner is clearly the star of the show, Goat Up is a fun little oddball that also has the distinction of being Llamasoft’s first platformer. Both games are arcade-hard, which means they look difficult from the outside but reveal their secrets to players who pay attention, changing from brutal to accessible (but not easy by any means) once their individual quirks are understood. Learning to rely on the rear-gun in Gridrunner to clear enemies on the lower part of the screen or figuring out how to use the kid-trail to bop oxen on the way up Goat Up‘s tower goes a long way towards earning scores worth posting. High-end play in Gridrunner in particular feels utterly fantastic, as moves that look like crazy risks turn into just another tool for survival when you’re in the flow of the moment and know that yeah, you got this. 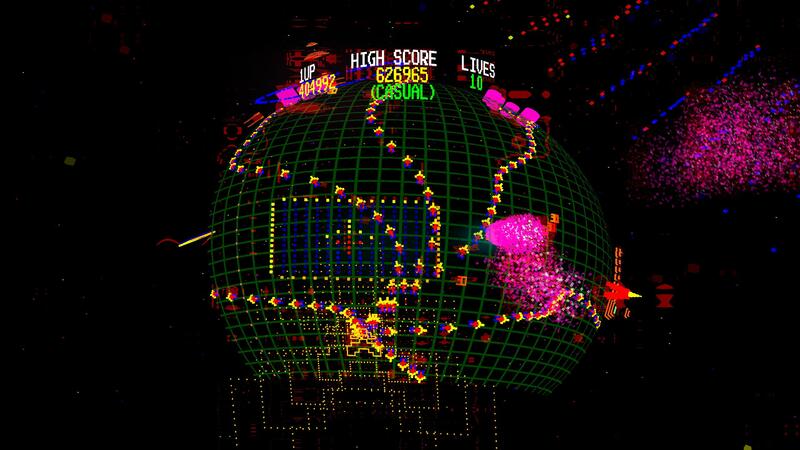 The Minotaur Arcade games may not look like the same high-end product as Polybius or Tempest 4000, but they’re still top-notch games that will embed their voxels deep into your brain.